Steel Alloys and Rolls! Cast and Ductile Irons! A surface hardening process in which heat is applied by a high temperature flame followed by an appropriate quenching medium. Progressive flame hardening involves the use of a flame head with integrated quench capability. The heat/quench head is moved along the part by various methods. This method is particularly well-suited for ways, flats, knives, and rolls. Spin flame hardening requires the specified area being treated to be spun in front of the flame source. Then the part is then taken to quench. This method is particularly well-suited for gears, wheels and sprockets. Combination flame hardening couples the progressive and spinning methods. The part being treated spins in front of the flame/quench head(s) and at the same time the flame/quench head(s) move along the length of the part. 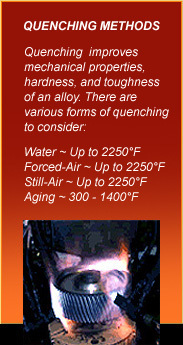 Call Tri-State Flame Hardening Company for your hardening applications today! We're easy to find in Macomb County, Michigan. Click HERE to find us.